Throughout the years, the world has had every opportunity to get to know Cee-lo and Jazze Pha for their musical talents. 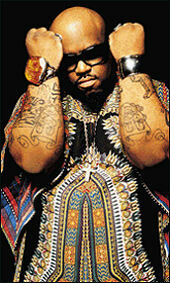 Cee-lo first debuted into the music world as one fourth of the rap collective, Goodie Mob. Since their start, he has released numerous albums with the group, as well as run a successful solo career. He’s also done a host of tracks as a member of ATL’s Dungeon Family alongside other members including Outkast. Now that the album is complete and the first single is killing the charts, they’ve embarked on a tour to promote their soon-to-be-released gem. We had a moment to catch up with Jazze and Cee-lo during one of their brief breaks, and they had a lot to say about their contributions to the game, and this album. MVRemix: Kinda touching on you guys hooking up again, what made you want to join forces with Jazze Pha for a full-length album? Cee-lo: Man, I just felt like it was time for us to get together and make this offering and contribution. We need to shine as a beacon and show our capabilities. That’s my take on it. Getting people accustomed to the schemes of urban music. This is going to push our music and culture forward. MVRemix: Is this something you would want to continue down the line if the album reaches its potential? We all know that you have your own respective solo career going as well, and you’ve done well with it. Cee-lo: I’m just going to be busy. This is casual, and effortless. We’re having a lot of fun doing this, and it doesn’t seem like work. Music is in our thinking and style and vibe. It’s really not a thing for me to get with Cee-Lo on a daily basis. Plus, the boy is a legend, so it’s not a thing for me to reach out to him, and he’ll probably have something going on at the time anyway. I’m having fun. MVRemix: He was telling me about the title. Can you shed some more light as far as why it’s called “Happy Hour”? Cee-lo: Well of course, it’s basically our party, and we can ball if we want to. You know, and we’re having fun, and bringing the ladies joy. It’s a complete concept. MVRemix: What do you want folks to gather from this album? Cee-lo: Once they hear it, they will definitely see and hear us in a whole new light. It’s shocking and satisfying all at the same time. If anything, I encourage people to know my range. MVRemix: I know you also have done some work with Big Boi and Purple Ribbon, but what else is happening? Cee-lo: At this point in my career, I have established many affiliations. Of course, I’ve finished this project with Jazze, and I also have another solo album completed which will drop later next year. So I have both of those, and then I have an album with Danger Mouse. MVRemix: Oh man, now that should be off the chain man! Cee-lo: That’s definitely going to be off the hook. Also be on the lookout for that. Also, we’re working on the preliminary for a new Goodie Mob album. MVRemix: Oh man, now you know people have been waiting for that for a long time! I talked to Khujo right after Hurricane Katrina, and he spoke on it. He was equally excited man, so I know that’s going to roll off nicely. Cee-lo: Yeah, so I’ve been working hard. I got a lot of hats man, but I’m wearing them well. MVRemix: Now are there any final thoughts on your behalf? Cee-lo: Oh, just much love to everybody and all the fans of the music. There’s plenty more where that came from!